DnDnext Playtest Begins! Downloading Trouble? Today is the day! I was very excited to receive an email from WotC this morning officially inviting me to the playtest. I filled out their form with my name and email, agreed to the terms and conditions, and was told I would receive a download link in 30-60 minutes. One extended coffee break later, and the download email arrived. Clicking on the download link just brought me to wizards.custhelp.com instead of downloading anything. A few of us early risers were puzzled by this, until Superman2489 pointed out that if you search for DnDnext Playtest Documents on the wizards.custhelp.com page, the download link comes right up. Update: Apparently the first links sent out were corrupted, and the issue should be fixed by now. Also, if you’re email address for DDI is different than the email address you signed up with, it can cause issues downloading it. According to the NDA (Yep, even us public playtesters have to agree to a non-disclosure agreement) I can’t quote excerpts from the documents, but I can talk about my experience with the playtest. I just wanted to provide this download tip in case other playtesters are having similar trouble. The four classic classes are represented, as well as the four most popular PC races. Included is an adaptation of the classic Gary Gygax adventure B2-Keep on the Borderlands called Caves of Chaos, as well as a Bestiary (not monster manual, interesting), DM guidelines, and a brief quickstart guide called How to Play. According to the letter from Mike Mearls (Chief of DnD Research and Development) this is just the first round, and there will be more to follow. There are a lot of familiar mechanics, as well as some twists on old favorites. I wish I could go in to detail, but it’s all very hush hush for the moment. Once we get the group together and all sign-up (all players and the DM must sign-up before playing according to the Terms and conditions), we’ll let you know about our experience here! Hopefully we won’t get in any hot water, but it’s tough to talk about the experience without talking about the mechanics. We’ll have to see how others navigate these tricky waters. GeekOut 2012 – Game ON! The Asheville gaming community is buzzing with excitement about the awesome day of gaming at GeekOut 2012! If you live anywhere near the Asheville area, and you haven’t signed up for games at the warhorn, what are you waiting for?! IT’S TOMORROW! My gold-foil copy of DCCRPG showed up on my doorstep just in the nick of time. I’ll be running Portal to the Stars for both the 10AM slot, and the 6PM slot. I’ve got other adventures too, so I could be persuaded to let you in to the Tower of Crowan the Conjurer (RIP Pamela), or we could try the freshly arrived Doom of the Savage Kings! It’s all DCCRPG, so it’s all awesome. Other things going on at the GeekOut include board games presented by the Wyvern’s Tale, plenty of Pathfinder Society including special scenarios run by 5-star Venture Captain Del Collins II, tons of panels, costumes, geek trivia, and a zombie prom! What more could you want? Check out the full schedule here. When you roll up a zero-level character in DCCRPG, you start with an occupation or day job, some kind of primitive weapon (say, a pitchfork), and some type of trade goods, as bartering is very typical and coin money somewhat scarce. One of our guys rolled up a farmer with a pitchfork and a hen. In one particular encounter, the party happens upon a cockatrice. If you aren’t familiar with the creature, it’s essentially a demon rooster that can turn people into stone. 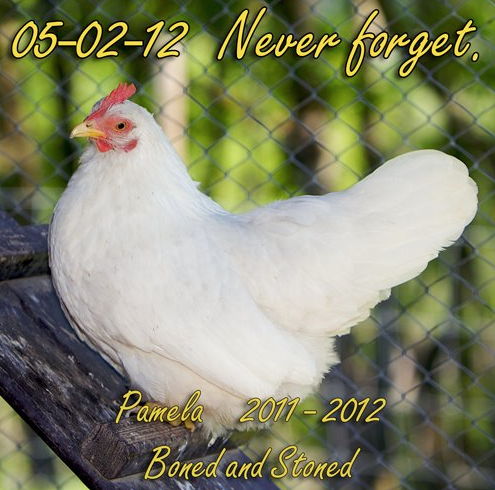 Our quick-thinking, intrepid farmer turned his chicken around and offered the business end of Pamela (the chicken) as a distraction. This was the most ingenious use of trade goods I had ever heard of, so as a good GM, I let it play out. With the cockatrice “distracted,” one of the other PCs landed a solid hit on the creature, killing it, but also turning Pamela to stone. The farmer put Pamela in a bag and attempted to use her as a bludgeoning weapon later in the game, but she was never as effective as her first game interaction. There were a lot of other great moments that evening, but that one was particularly hilarious. The fact that your PCs start with so little allows them to come up with some incredible uses for their limited gear. It also leads to some really memorable stories. Starting out with 5d12 copper, 1d4 hit points, and a chicken may not sound like its going to be fun, but believe me, it is not to be skipped! 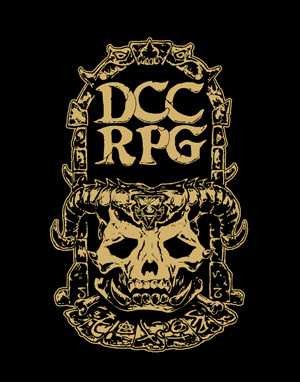 I’m interested to see what other 3rd party developers come up with for DCCRPG. Purple Sorcerer is coming out with what look to be some very cool adventures for DCCRPG, not to mention some really cool tools to generate characters quickly, or virtually roll some of the weird dice you may not own yet. Thick Skull Adventures is coming out with Attack of the Frawgs! which looks to be a cool old-school scenario as well. Goodman Games has a good round up of all the 3rd party developers towards the bottom of the page here, as well as the new Fan-zine, CRAWL! I’m really looking forward to running Portal Under the Stars on Saturday for GeekOut 2012. If you live anywhere near the Asheville area and want to get some gaming in on Saturday, sign up and at the Warhorn, and come on down! See you there! PS – All the submissions are in for the One Page Dungeon Contest, and there were 107 entries! Best of all? You can download all 81 MB of them from the contest page. Free dungeons for all! Pirate Pregens for Pathfinder Society! 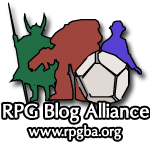 Skyland Games is proud to present an ongoing weekly series for Pathfinder Society play. As a group, we have been enamored with both Pathfinder Society and the extensive character creation options in Pathfinder. This is probably why we love games with unique character creation systems such as Traveller, Teenage Mutant Ninja Turtles, and Dungeon Crawl Classics. 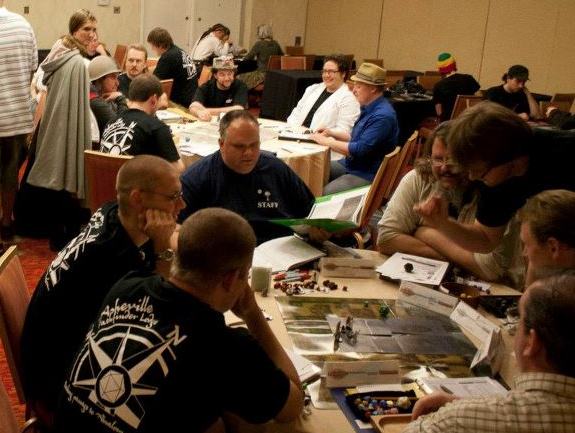 Having a well fleshed out character can make the difference between fun and flop at any event, whether it be gaming with your buddies or a table at an organized play event. Sometimes we just do not have time to create a character with the complexity that we desire or show up at an event unprepared. This is where our new series comes into play (literally). Each week we will present a group of five pre-generated Pathfinder Society legal characters bound together in some way, whether it be race, theme, or even a weapon. While each grouping will be tied together, each group will also be diverse in class, archetype and faction to give each player a challenge to work with while creating a balanced party. We have provided basic equipment such as weapons and armor. Additional items can be purchased and the characters can be personalized as you see fit. Just in time for Paizo’s new Skull and Shackles campaign path, this week’s group consists of the Pirates of the Toothless Gar. After a failed mutiny, five pirates were set adrift in a dingy to pay the price for their treachery. Dubbing their new vessel the Toothless Gar, the pirates found themselves in Absalom and the Pathfinder Society, where gold and glory await them!